Some last minute work going out the door. This one is heading all the way to WA. Some inspiration to share. I'm loving this magazine, it is full of wonderful ideas. This is not for the faint hearted. Please be warned. 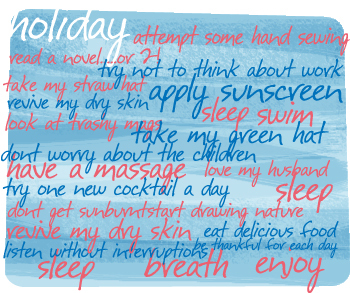 If you have not had a holiday for some time or haven't planned a holiday for the near future, please read this post with caution. I don't want this post to be a 'oh, look at me, this is where I am going' type of post. 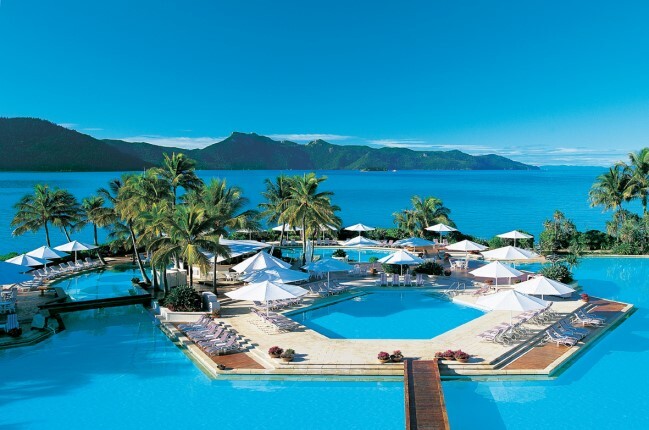 It has been many years since we have 'escaped' and I had many an argument with my better half about going on any kind of holiday. So please no bad will intended. We are escaping, children and dog in 2 and 1/2 days! The next two days are full of madness and mayhem, as I get some ABCme/tsk tsk jobs out the door, pack bags, organise children, collect pies from our kindy pie drive, general other business and domestic duties to fulfill. Apart from one weekend, this will be the first time in almost 4 years since N and I have had a holiday together without children. I can't imagine what it will be like to have a conversation without being interrupted; wake and be able to go back to sleep; think about what I would like to eat without preparing a dozen little meals a day..well, OK, maybe not that many! I honestly won't know how to relax. AND I won't have my computer! OMG! I am a worrier! And I can't help thinking about the kids...and the how the grandparents will cope! And I hope the dog doesn't bark too much and annoy everyone. Last night, I felt the need to make something with my new material. 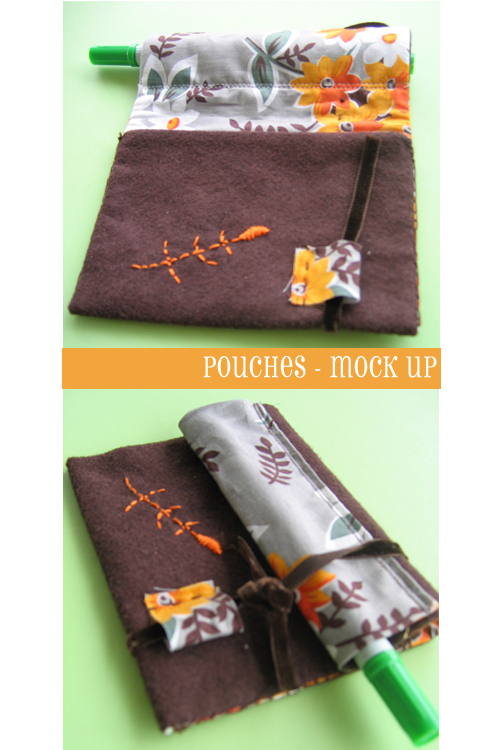 I discovered this tutorial on the molly chicken blog site. Very cute site. When I get an idea in my head, I couldn't be bothered making a sample from calico or cheaper material, I need to work with the colours and textures. If I make a mistake, well so what. I used some woolen felt and velvet ribbon. I started to embroider, and wished I hadn't..or perhaps I wished that I had before I sewed the two pieces together..would have been a lot easier and perhaps produced a neater stitch. I adjusted the pattern from the tutorial a little. The next one...slightly bigger so it can hold a note book and I'll top stictch the overlap in the middle so it can hold 2 pens/pencils. I went to my favourite fabric and quilting store yesterday to buy some backing material for a quilt I am making and ended up buying other fabrics I couldn't live without. It is so dangerous sending me in to a fabric or stationery store. 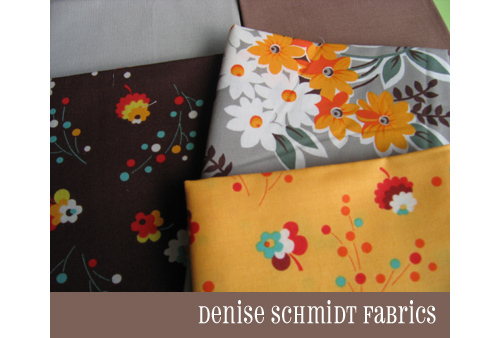 Some of the fabric were these Denise Schmidt beauties. I came home and sorted all of my fabrics into similar colours and bagged them. I discovered these brown and grey fat quaters I bought ages ago, they work really well together. Now all I have to do is think of something to make out of it. But I am sure that I will get plenty of ideas from a nice little mail delivery I received the other week. 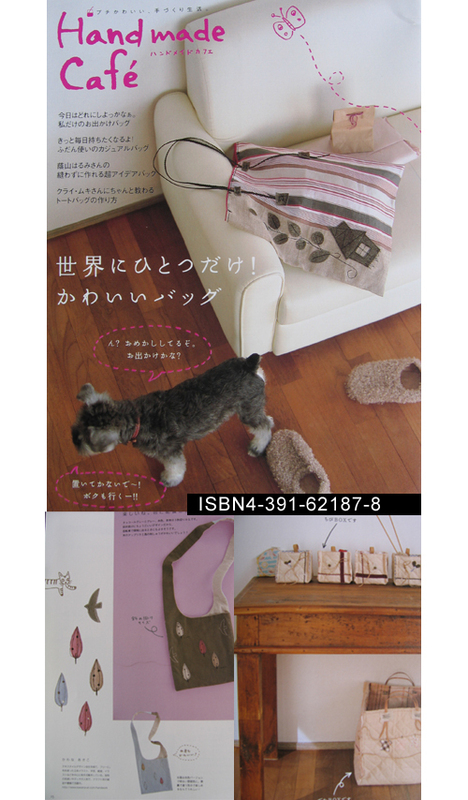 I ordered a stack of Japanese Craft books. After looking at other blog sites and becoming so inspired by them I had to get some. I promise to post all of them with samples so you might get some inspiration too. This is the first. 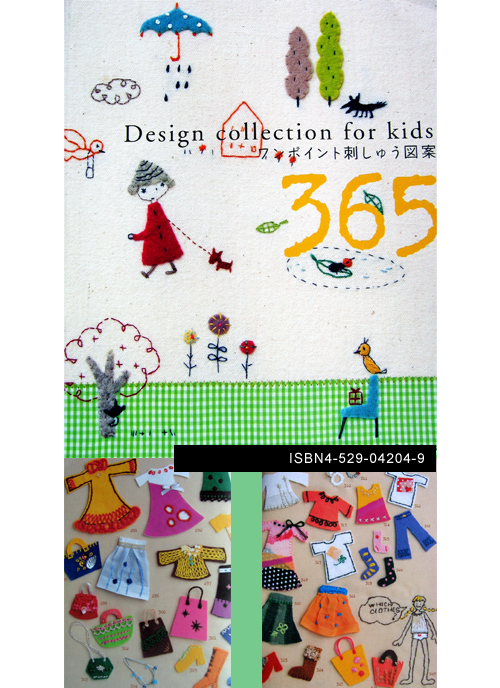 It is called Design collection for kids. It is mainly embroidery work. I just love this idea of the little person and all these gorgeous clothes that you can dress her with. Now I want to design and make my own and package it all up as a little gift for Mila. our fridge is dying. It has been dying for sometime...I don't think it will see out this coming summer. this is our fridge...well actually it is the top half...the freezer. It got me thinking. Why do we stick things on our fridge? What does it say about who we are? 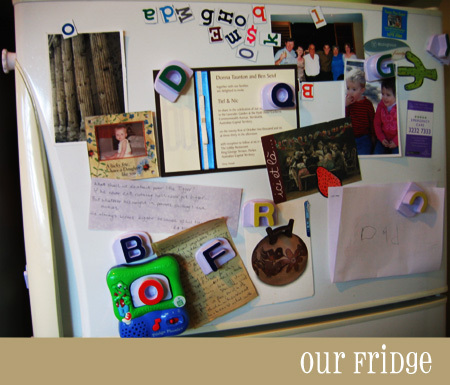 Are the types of things on fridges, related to our personality?..Our current life?...our history? The things we should do?....the things we did? a guided tour from bottom left in a clockwise direction. Leap Frog alphabet, music thing. you put a magnetic letter in and it tells you how to pronouce that letter. (English accent) It also plays the alphabet song..you know the one. "What shall we do about poor little Tigger? He always seems bigger because of his bounces." A baby photo of me that my mum gave me. It says, " a lucky few have a daughter like you"
A photo I took in Rome. Columns full of bullet holes. An invitation to my brother's wedding. I really must RSVP. A family photo taken at our so called wedding. So if you want to blog your fridge. Go ahead. I've been sitting here for a good part of my day trying to work....I need a break now. I think I shall tackle the dining room sewing mess. I actually like organising all my sewing gear. But I'm not to start anything new. 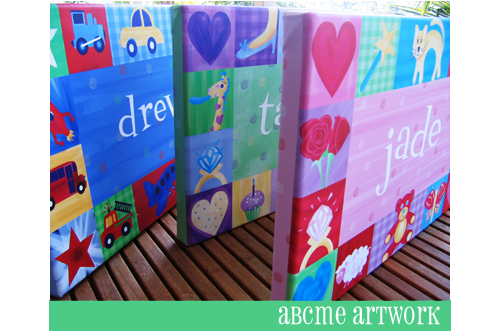 I picked up some canvas artwork today and designed some more orders. I posted 'Edward' below because I got to pick the colours for this one. I love making these for people, but all those bright colours are a bit too much for me sometimes. So I decided to go with the browns and greens. 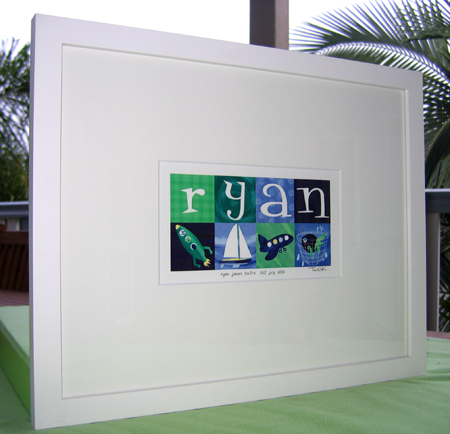 I think his mum will like it and it will suit the nursery. Big day ahead. I got up early and got this out of my thinking space. buy some dog food and garbage bags;...don't worry he ate. Now...go and wake Miss M and have second cup of tea. I received this little package last Friday from applehead. Thanks Marianne. It is full of 'mostly old paper'. I love all the bird images and poetry. 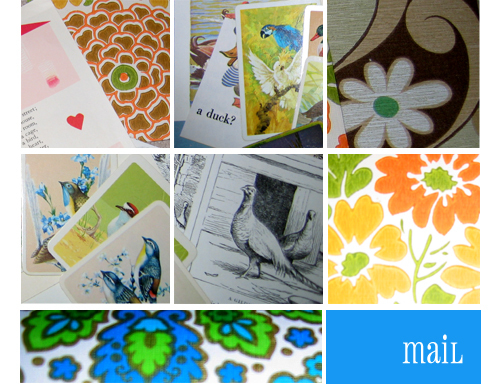 I really love the wallpaper swatches, especially the orange and yellow flowers (middle right) and the blue and green one on the bottom. I will add all of this to my new craft shelves and wait for the right project to use it all in. 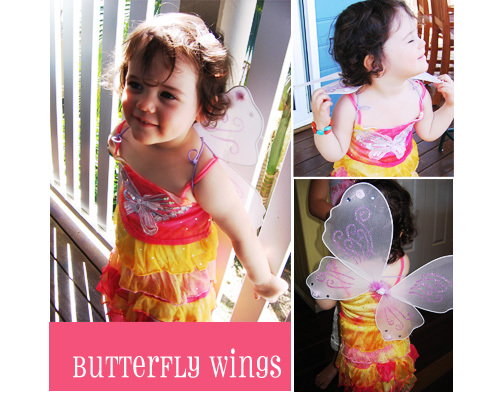 Miss M was given her very first butterfly/fairy wings from my mum yesterday. I couldn't resist posting these photos. She is so proud and even wore the skirt to bed last night. A little while back I asked Ivonne from Cream Puffs in Venice if she had a receipe for lasagna. My mother in law is Italian and she hasn't written a recipe down in her life. It is all in her head. So, if I want to learn how to make something, I have to watch and take notes very carefully. My mother in law makes a delicious lasagna, with home made pasta, freshly made sauce from their own conserved beer bottled tomatoes and no bechamel. I don't mind a little, but my husband hates it. I swear I can eat double the amount than any other lasagna....maybe not such a good thing. But somehow she always changes it a little, so I just wanted a good written basis to have. 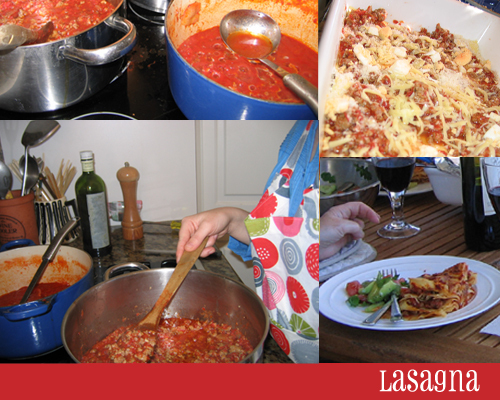 Ivonne's mother made this recipe, true Italian mama cooking. It is all on her site amongst other mouth watering treats. I think I will try the stuffed eggpland next. I don't have an overly sweet tooth, but the apricot flan looked fantastic. With family here today I decided to make it. Here are the photos to proove that I did it...the only confession I have is that I used bought pasta. 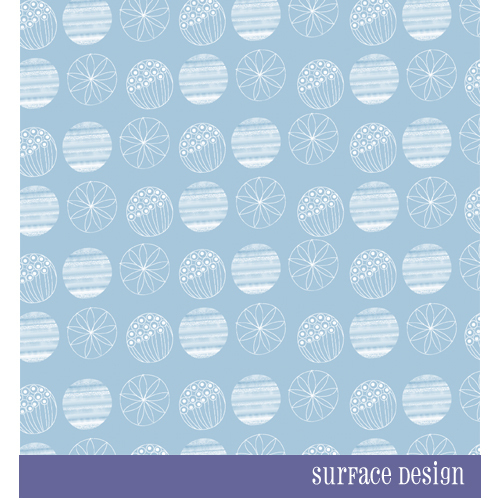 I can make fettucine and the like, but I'm a little nervous about making big, flat sheets. I'll have to wait for my M-I-L to help with that one. Plus I was taking care of 5 children aged 2 to 10...and now I'm tired. I asked my nieces and nephew if they liked it and they said that it was a tie between me, their mum and their nonna! For a non Italian, I was impressed! Thank you Ivonne and your mother too. Both Baby and Mum are doing really well. Arielle came out breathing all by herself and is still continuing to amaze doctors, staff and parents. Thanks for the wishes everyone. Here are some photos.